Feike has complemented the current fishery information and statistical systems (FINSS) database by developing a series of integrated web-based fishery management modules for the Mozambique Ministry of Fisheries. Aquaculture Module, which comprehensively records all data relevant to the management of small-scale and industrial-scale fish farms. Each module can be adapted to meet client specific needs and can exist independently of each other and of FINSS itself. Because the modules are web-based tools, they can be installed, administered, updated and managed remotely. Abalone right holders have planned a second protest at the offices of Department of Fisheries on 3 November 2011 at 10am. The right holders will deliver a second memorandum to the Minister of Fisheries. 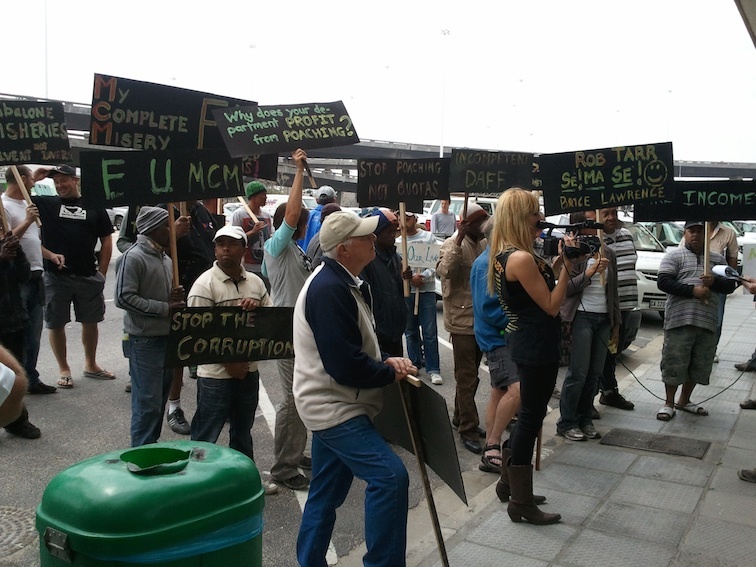 The Minister of Fisheries has failed to respond to the memorandum handed to her officials during the first protest. The fisheries department announced via email that the Minister has decided to set the abalone TAC at 150 tons for the 2011/2012 season – the same as for the 2010/2011 season. It is unclear whether the Minister’s decision on the abalone TAC, which precedes an announcement on the lobster TAC even though the lobster season opens on 15 October 2011 for Zone A (Port Nolloth), is in response to the protest action and demands by abalone right holders yesterday (13 October). She will undoubtedly deny that this is the case. The department has also hurriedly convened an abalone management working group for 19 October 2011 having previously postponed an initial working group meeting indefinitely. It is understood that although many right holders in Zones E and G are pleased with the announcement, they still want the Minister to respond to the issues raised in the Memorandum handed to her Acting Deputy Director-General of Fisheries on 13 October 2011. 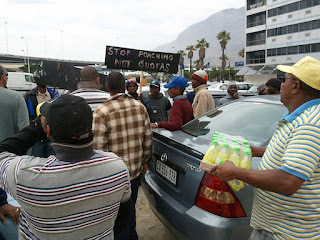 On 13 October 2011 abalone right holders who are almost exclusively from Zones E and G protested against the department of fisheries and its Minister. Almost no right holders from Zones A, B, C and D – which are the zones threatened with complete closure – bothered to attend the protest. The reason for the non-attendance is unclear although one zonal representative is believed to have been in a meeting with departmental officials when he instructed another representative to inform Scott Russell of Abalone South Africa to immediately cancel the protest! Why would right holders who face a zero abalone allocation so fundamentally oppose protesting against the proposed closure of their fishing zones? Does 1 plus 1 add up to 2? The memorandum (see article below) was handed over to the Acting DDG of the fisheries department, Mr Wickness Rooifontein. The Minister continues to be the most absent minister in the history of fisheries management! 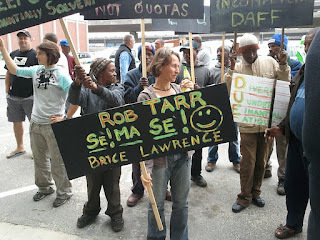 Below are some pictures of the protest, the protestors and their colourful placards. We are legal and law-abiding commercial abalone fishers who have been completely ignored by you and your officials at the Department of Fisheries. Even though you were appointed as the Minister of Fisheries in June 2009, you have NEVER EVER met with the abalone industry; consulted with us regarding compliance, management or recovery of abalone stocks. You and your department have completely forsaken our social and economic well-being. This memorandum raises only our most critical concerns and we demand that as the Minister responsible for fisheries, you now finally take responsibility for implementing measures to address these concerns. Your department (DAFF) continues to rely on the sale of confiscated abalone to fund a substantial part of its operational budget. This is extremely immoral IF NOT illegal. It is a fact that it is in DAFF’S financial interests to ensure that large scale poaching continues and more and more product is stolen and then confiscated so that DAFF can sell the poached product for PROFIT. It is a shocking fact that the legal abalone fishery must compete with DAFF for buyers especially since DAFF continues to sell sub-standard product at substantial discounts to export markets. This is ruining BRAND SOUTH AFRICA and the ability of law-abiding abalone right holders to earn a living and to continue to provide employment. • DAFF’s financial interest in poaching be terminated immediately! One of the key “conditions” imposed by Cabinet for the re-opening of the commercial abalone fishery was the reduction in poaching levels and improved compliance. Yet, the Chief Directorate: MCS is in a state of implosion and does not even have a permanent head of MCS. Your own officials have admitted in a recent (January 2011) publication that the department has no compliance strategy in place to protect abalone. 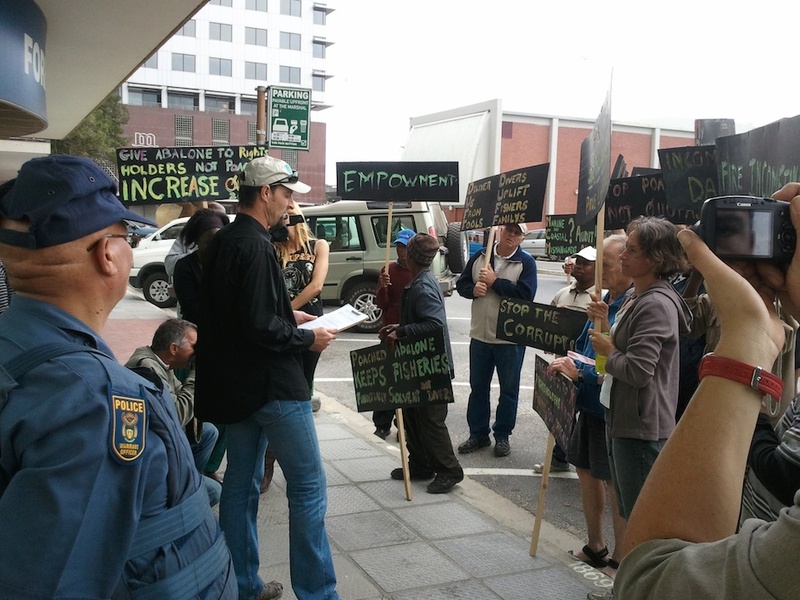 • Despite numerous regular “tip-offs” provided by abalone divers and members of the public of day-light poaching in areas such as Llandadno, Hout Bay, Buffels Bay, Perly Beach etc, your officials have NEVER responded effectively to any complaints. • The so-called Overberg abalone “hotline” is never answered and just rings. It serves no point at all. • Due to the mismanagement of the Marine Living Resources Fund, your department no longer has the budget required to implement a compliance strategy. Despite requests for access to the Compliance budget, we have still not been provided with this. • Fishery control officers are poorly trained and lack basic understanding of the law and what is required of abalone right holders under permit conditions. Proof of this is the number of prosecutions your department has lost and the number of cases prosecutors & magistrates have thrown out of court. • Fishery control officers are not allowed to work over weekends and after 4pm! This is ludicrous in the extreme. Slipways and harbours are routinely being left un-monitored, allowing for large-scale poaching of abalone, lobsters and line fish. • Although we regularly hear of “arrests” of poachers and syndicates (such as the 19 poachers recently arrested and the 29 arrested years ago for poaching at Robben Island), they are not prosecuted, fined the maximum of R800,000 and their assets are never confiscated. Arrest of poachers is meaningless if they simply walk free. • The use of the environmental protection vessels is a waste of time and money. They were not designed for inshore patrolling. They are huge, costly and too slow to stop abalone poachers who use high-speed RIBS. • The continued use of the “military vets” for compliance is an embarrassment and smacks of nothing more than cadre deployment. They are shockingly trained and lack basic knowledge about abalone enforcement strategy and monitoring. We are not aware of a single case where they have apprehended poachers or stopped poaching. • to work with well-trained and competent FCO’s to reduce poaching. Has your researchers provided you with comprehensive research analysis and data on the non-existent abalone fishery recovery strategy? Your researchers have NEVER undertaken any proper underwater research on abalone fishing zones such as Zones E and G. How is this possible? How can they provide you with any form of reliable and adequate data on our abalone resource? Have you received annual data analyses on how abalone stocks are doing in protected areas such as the Betty’s Bay MPA? We assume not. Why is industry excluded from studying any of the ‘’research reports” that inform the TAC proposals you receive. Do you get to read and study these research reports? The abalone industry has repeatedly tried to obtain access to these “secret reports”. Why are they a secret? Perhaps because they are based on such factual fallacies that they fear industry would expose? • to participate in and be consulted adequately (as required by law) on the annual TAC proposals. THE ABALONE FISHING POLICY OF 2003 IS STILL LAW: WHAT HAPPENED TO OUR TURFs? The abalone fishery is governed by the Abalone Fishery Policy of 2003 which requires abalone right holders to be allocated fish based on the TURF system. • Why have you and your department unilaterally and unlawfully abandoned implementation of legally binding policy? • Why are officials employed who cannot produce the proper inter area schedules and who claim that it would take months were they to attempt to do so? • Where is the co-management of the fishery that you speak of all the time? Why is DAFF so unwilling to cooperate with the abalone fishing industry? 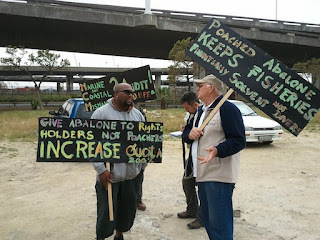 • Why do your officials act as obstacles to the effective management of the abalone fishery? For example, why has it taken more than 2 seasons for them to implement the East False Bay Experimental TAC? • To move away from using TAC decreases as the only management mechanism as this has failed hopelessly. Why can’t we increase the TAC to displace poachers? Poachers are being allowed by your department to steal between 2000 and 3000 tons of abalone annually! Decreases in our 150 ton TAC can never help with the recovery of abalone in these circumstances! • The increase would fund a comprehensive compliance strategy – Operation Trident. In 2005, the Green Courts were closed and Operation Trident was terminated AND nothing replaced these. Since then however our levies have only been further increased! – while we receive nothing except incompetence and failure in return. On 31 May 2011 we addressed an urgent letter to you regarding our objections to paying the current inequitable and unjust levy. You have failed to respond to this letter and continue to ignore our concerns and objections. We will now withhold payments of our levies to the Marine Living Resources Fund until such time as you have the decency to reply to our letter and we can agree on a reasonable levy that is in line with levies payable in the other commercial fishery sectors. Why is Industry Not Consulted on TAC’s? A few weeks back Feike, together with the Abalone Industry Association, requested that the department of fisheries make available certain reports that were used to inform the scientific recommendations on the 2011/2012 abalone total allowable catch (TAC). The department’s officials initially refused access to these documents as they were deemed “confidential”. When Feike noted that as the “Secrecy Bill” was not law (yet), officials did not have a right to simply decide what is “secret” or confidential, the officials changed tack stating that application for the documents should be made under the Promotion of Access to Information Act (PAIA)! Feike then requested access to the department’s PAIA Manual which, we noted was not available on the DAFF website and could not be found anywhere. Every department must have a PAIA Manual stating, amongst other things, which categories and types of information are freely available without having to adhere to the normal PAIA request for information process. We also pointed out that all TAC documents must be made available on request in terms of the General Fisheries Policy of 2005. Our requests for the Manual were fobbed off and of course the officials pretended to not know about that policy of 2005. Then suddenly, a couple of days after we demanded access to the PAIA Manual noting that a refusal to provide the Manual constituted a criminal offence, a brand new PAIA Manual suddenly appeared on the DAFF website, specifically excluding public access to current TAC documents! How convenient! And how incredibly dishonest! But by unjustifiably “classifying” as secret such critical documents that directly inform the how and why TAC’s are set, DAFF has now in effect forced the Minister of Fisheries to first consult adequately with the abalone fishing industry (and for that matter other fishing industries) BEFORE she unilaterally publishes TAC’s, especially where the TAC results in quota decreases. Lobster Fishing in the Closed Season? It would appear that the commercial lobster fishing sector is abuzz with corridor talk about the fact that two Gansbaai fishing companies have been allowed to harvest an offshore lobster fishing quota in the lobster closed season (1 October 2011-15 October 2011). Feike, together with Shaun Hangone of Cape Town law firm, Von Lieres Cooper Barlow Hangone Attorneys, was appointed by Dyer Eiland Visserye and Scenematic 16 in September to urgently protect their respective commercial contractual interests involving a lobster quota they were entitled to harvest, process and market. During late August, the right holder concerned proceeded to breach certain contractual obligations and demanded that the Minister of Fisheries cancel its fishing permits which were held by Dyer Eiland and Scenematic 16. The Minister duly cancelled the permits in late August and despite efforts to convince the quota holder to respect its contractual obligations, it became clear that the quota holder was intent on double dipping by selling its quota twice! So, off to court we went seeking an urgent interdict against the right holder. The Minister was joined as a respondent but as the matter was a commercial dispute, she agreed to abide the court’s decision and agreed to “immediately issue permits” to Dyer Eiland Visserye and Scenematic 16 should the court grant the interdict. On 27 September 2011, the Western Cape High Court issued an interdict against the right holder. The application was completely unopposed as the right holder failed to oppose the application. The Minister agreed to issue permits immediately on the 27th. By the 30th of September – the last day of the season – the Minister had still not issued the permits in terms of the court order of 27 September 2011. Accordingly, at about 3:30pm on 30 September 2011, the WC High Court heard an urgent application to hold the Minister of Fisheries in contempt of court. The court was particularly concerned with how the court order of 27 September 2011 could be given effect and the dignity of the High Court protected and thus granted Dyer Eiland Visserye and Scenematic 16 the right to harvest the lobster quota until 18 October 2011 (which is the date on which the court will hear argument on the Minister’s contempt of court allegation). It is important to note that on 30 September 2011, the Court again ordered the Minister to issue permits to Dyer Eiland Visserye and Scenematic by 8am on 3 October 2011. The Minister had failed again to comply with this order and could thus be said to be in “double” contempt if such a concept exists. If one recalls, in January 2011, this Minister narrowly escaped contempt of court charges by issuing permits to a Feike client at the very last minute. What is deeply concerning is that we are increasingly facing a Minister and a department who simply appear to be above the law. They appear committed to simply do as they wish regardless of the impact it has on commercial fishing companies and the ability to go fishing. We of course remain committed to holding these public servants to account. The rule of law cannot be sacrificed at the alter of arrogance and incompetence.